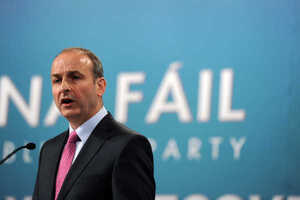 Leader of Fianna Fáil, Micheál Martin TD, will join Brendan O’Connor on [RTÉ 1’s ]The Saturday Night Show [at 9.55pm] this week to talk about his life, family and why rebuilding Fianna Fáil matters so much to him. 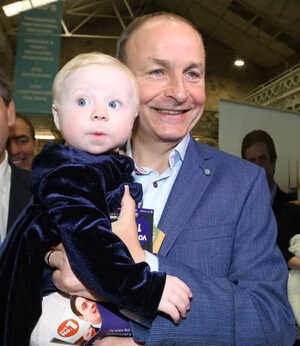 Posted in Misc and tagged Fianna Fail, Michael Martin at 4:58 pm on November 14, 2014 by Broadsheet. I’m glad to see RTÉ giving Fianna Fáil a fair chance. I mean, they HAVE learned their lesson. 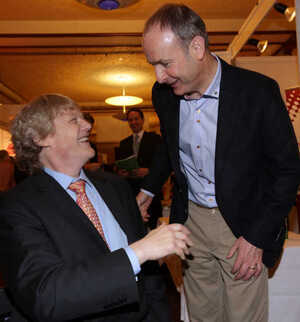 Two Cork windbags expelling oral flatulence to each other for 20 minutes. Still better than Fair City. Our next Taoiseach, to be sure to be sure. That’s what i’m thinking. Even RTE know Fine Gael and Labour will be dead and buried next GE. And the resurrection of FF’s new messiah is to be Courted before he gets in to power. Sickening to think that’s the way it’s going. Listening to the leader of FF lecturing GA on the cover up of child abuse this week was seriously uncomfortable. e.g. I want a new system and for NONE of the established parties or their party politics to prevail after the next GE (yea I know idealistic to the nth degree) but with the correct voting strategy and enough independents in play could a popular movement ensure that none of the established parties get a foothold? I’m confident that a severe dent is going to be made but within a PR system is it actually mathematically achieveable? am I right in saying it’s setup in favour of establishment politics….any smart people know the answer? Well in the UK, they have a first-past-the-post system and they (up until now) have almost always resulted in basically a two-party system. Our PR system is more likely to get independents and smaller parties elected, I think. He’s only on BOC and not the Late Late so people don’t ask awkward questions about Tub’s family connections again. On what planet is putting “FIGHT!” at the end of every second post funny? 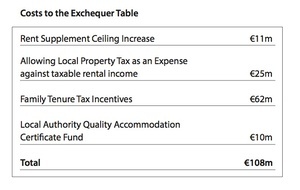 is now being robbed by FG and fleeced by Labour.